One of the most frequent questions we’re asked, here at Video School Online, is how do you get a job in the video industry? Luckily, we’ve been working in the film/video industry, and have interviewed dozens of people working in the film industry. But before we dive into the practical ways you can start your filmmaking career, let’s define what we mean by film industry? What do we mean by Film Industry? To many people, the video industry might mean the place where they make movies that you see at the theater. Of course, movies are made everywhere now – not just Hollywood or New York. With the expansion of online media distribution, you don’t need to work on a Hollywood set to make videos seen around the world. To us, the film industry means making videos and getting paid to do it. You can make money many different ways in the video world. All of these are great ways to start out your film career. It’s important to have an end goal in sight, though, as it will guide you through the different types of work you do. While doing corporate video work is a fine career path, you can also get stuck doing it if you don’t keep your end goal in mind. As you start out, and take on jobs, try to take only jobs that push you toward your goals – no matter what the pay is. Think about the long term, because it’s easy to take a job that pays well now instead of a non-paying gig that might lead to your ideal career. Our most important piece of advice to finding work in the film industry is to work on personal projects. This means making your own videos, and collaborating with friends (we’ll share why this is just as important as creating your own projects shortly). You will learn more than in any film school class by making your own videos. It’s important to learn all the different aspects of filmmaking – from pre-production to distribution. Directing your own projects allows you to become a good leader. Being an actor lets you know how hard it is to be in front of the camera. Editing your own videos teaches you how to be a better cinematographer, knowing what shots you need to tell your story. Distributing your own videos can help you learn how to tell a story that resonates with the audience. Work on projects that push your creativity. Work on videos that are low budget, independent versions of your ideal film career. If you want to be a documentary filmmaker, make short documentaries. So many wanna be filmmakers spend too much time worrying about getting the ‘perfect’ camera. We know how fun it is to play with the latest technology, but at the end of the day, having a good story is much more important than your camera. Heck, your smartphone is a great way to get started. Where should you share your videos? YouTube, Vimeo, Facebook, Instagram, Behance… these are all great places to share your projects. Vimeo is great for higher quality video projects. But YouTube has a bigger audience. Facebook gets you a lot of views, but isn’t great for longevity. We recommend the be everywhere approach. Putting your projects on all these platforms gives you the best chance to be seen. Why working on other people’s projects is so important. Working with other filmmakers is potentially your ticket to consistent work, and career advancement in the film industry. As your community of filmmakers work on bigger and better projects, they can bring you along. These are just a few of the skills that it takes to make a video. If you can become the go to editor in your group, you’ll find consistent work on your friend’s projects. This also goes back to the importance of discovering your end goal. It’s not just about the type of film projects you want to work on, but also what specialty you want to do. It’s also much more than just using these tools of business. Do you make videos to make people laugh? Do you make videos to help a cause? Do you make videos to help grow businesses? Knowing your mission as a filmmaker will come across in your website, projects you take on, and general online presence. Think about who you serve with your video projects, and this will help you develop your own brand. There are four key ways to getting work with your video skills. It’s important to know how to charge for your client projects. Use Craigslist, LinkedIn, and other job boards to search for video work. While not glamorous, Craigslist can be a great way to get your first paid video gigs. LinkedIn is the perfect place to connect with other filmmakers in your area. Search for filmmakers who live near you. Connect with them. Message them an introduction, and ultimately pitch your skills to them. When I moved up to San Francisco, I messaged 5 video editors that I found on LinkedIn. 3 of them messaged me back and brought me into their office for an interview. One of them hired me consistently to work on video projects for clients such as Google. This led to a full time job offer… all from messaging just 5 people in my area. As videos become more important for every company’s communications, you never know when someone will be looking for help. Local businesses are another perfect place to find video work. Check out the web presence of all your local businesses. Most probably don’t have a high-quality video presence. Put together a pitch with the type of video you can produce for them, with links to examples. Walk into, call, or email the local businesses that need better video presence. When starting out your film career, it’s important to let the world know about it! Tell your friends and family that you are available for hire. These are usually the first people who will hire you. Even if you just do projects for free, you can ask them to refer you to their own friends and family if they ever need help. Try getting referrals from your filmmaking friends. They might work on projects that need your skillset. There’s no easier way to convince someone to hire you, than meeting in person. Compared to reaching out online, you will be more memorable if you meet potential clients in person. Make sure you always carry a business card on you. A common rookie mistake is not having a business card that you can give when meeting new potential clients. Go to local meetups – not just for filmmakers, but also for local businesses. As you can tell, we highly recommend starting your career by working on business videos. While you start to make money with client videos, it’s important to continue working on passion projects of your own. These are the projects that will push you towards your ideal career, when the business videos don’t. Over time, push yourself to make bigger and better projects. As you do, more people will see your projects as your community grows – and shares your work. These are also the projects that will feed your soul, and keep you going. Many people start a career in the film world, only to give up because they don’t make progress as fast as they want to. If you start to feel burnt out, just grab your camera and get creative. In this article, we’ve laid out a strategy that works well for people wanting to make a career with their video skills. If your end goal is to work on films that end up shown around the world on the big screen, there are different paths to get there. Many filmmakers start with the independent route, working on corporate projects on the side, until their ‘indie’ films turn into big budgets. Search for local film organizations. Typically, their websites will have a job board, and also community events. As I wrote a few weeks ago, one of the best ways to be successful at anything you do is to stick with it. No matter what you do, keep making your own personal projects. Keep working with other people on video projects of their own. Keep meeting people and putting your name out there. Rarely does anyone fail to achieve their goals if they stick with it, and dedicate themselves to their end goal. Learn new skills that make you a more valuable team member – our online courses can help you with that! Continue sharing your work online. Update your demo reel every year. Share any projects you work on, on social media. Using all of these techniques, you should find paying work that puts you on the road to success in no time! To get going, Julian walks you through getting in the right mindset. He’ll break down old paradigms, and shows you a new way of thinking about filmmaking. Making and sharing your own personal videos is the best way to start your filmmaking career. Phil shares his own personal stories of how creating personal projects propelled him to his first paying clients, and how you can do the same. 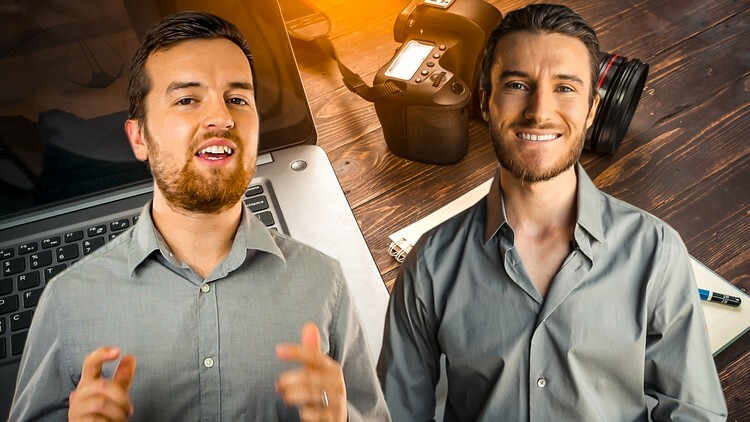 To legitimize your personal video production business, a solid demo reel, website, and solid online presence are key to getting your first clients. Julian takes you through all the steps, so by the end of this step you’ll have a better online presence and stronger self-image that helps you as a filmmaker. It’s time to get your first paying clients! Phil shows you the ropes – helping you find clients in 4 different way – online, cold calling, through referrals, and in person. Getting clients to pay your for a video project is only the first step. Retaining clients is the way to consistent work, and growth as a filmmaker. Julian teaches you how to get consistent work by delivering video products that people love. Let’s take your business to the next level! Legitimize your business and protect yourself by incorporating. Negotiate prices to get paid what you’re actually work. Use contracts to make sure both you and the client are happy. In this last step of becoming a full-time filmmaker, Julian shows you some high-level t more tools to get and retain clients. READY TO START YOUR FILMMAKING CAREER?